The phrase that must be most used when leaving for the airport – what is the doggy equivalent of this phrase? Fleas, worms, bowl, food, bed….not quite as catchy. It is important to ensure you have a checklist of things to do/check and pack when you are travelling with your dog. If you are going abroad you will need a dog passport, you will need to be up to date with your dog’s vaccinations and you will need to understand the quarantine protocol if relevant. If travelling within the UK with your dog it is much easier, but you still need to ensure you are well organised. If you are going away on a UK holiday with your dog it is important to ensure your dog has recently had their dog worming tablet and flea treatment. If you are renting a dog friendly lodge then you do not want the embarrassment of being billed after you leave for the place having to be de-fleaed. When setting off on your journey you need to ensure you have packed all the relevant dog supplies you might need including their food, bowls, water for the journey, dog lead, bed, dog treats and any regular medication that your dog might need. 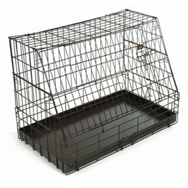 It is also worth looking at dog cages to ensure your dog can travel in your car safely and comfortably. www.nutrecare.co.uk sell a RAC approved dog cage – the real benefit of the cage is that the dog is contained in an area and is not as likely to distract the driver as much as when it were roaming the back seat and trying to climb on knees. Also, you would never let a child sit in a car without wearing a seatbelt so it makes sense to restrain your dog where possible – if you were to have an accident then a dog that was free on the back seat is likely to be seriously injured whereas one that is secure in a cage is much likely to fare better. Once you are on your journey it is important to stop regularly to give your pet a toilet break and the opportunity to stretch its legs and have some water. Remember that your dog cannot talk so he cannot tell you when he needs a wee so stopping every hour where possible is best. Avoid giving your dog food whilst on its journey as dogs hate messing “indoors”, so avoid the stress and just feed your dog as early as possible before you leave and again once you arrive.